And Justice For Art: Norwegian Rituals: Truls Espedal brings to life Enslaved's "In Times" album artworks. Norwegian Rituals: Truls Espedal brings to life Enslaved's "In Times" album artworks. Norwegian painter, Truls Espedal, has been collaborating with extreme/prog metallers, Enslaved, for more than a decade. By now, he has consecutively created eight of the band's album covers. That includes their new opus, 2015's "In Times." 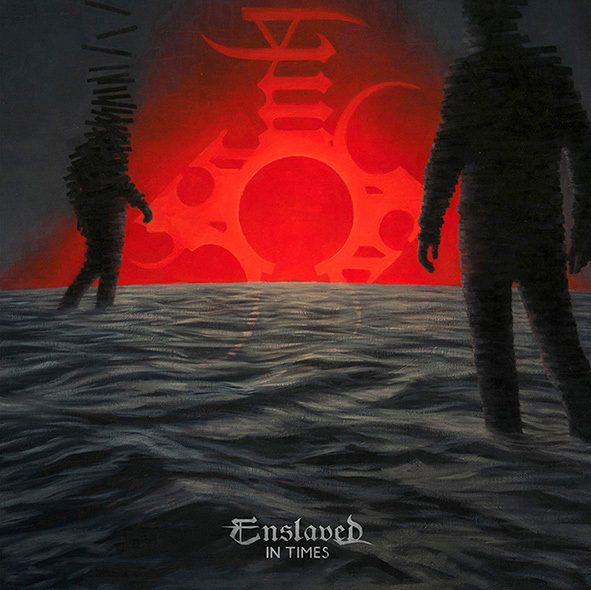 Both ominous and highly symbolical, the paintings adorning the album's front and back sleeve enrich Enslaved's and Espedal's visual lore. However, it also retain the human motif already explored on recent covers for "Riitiir" (2012) and "Axioma Ethica Odini" (2010). After revealing all the details about his successful relationship with the band in the critically-acclaimed book And Justice For Art, Espedal now discusses the making of the "In Times'" artworks in the interview below. AJFA: Who came up with the concept for this cover, was it you or the band? Truls Espedal: (Guitarist) Ivar Bjorson and (bassist/vocalist) Grutle Kjellson came up with the concept. It ties in really well with their theme and the lyrical content of the album. 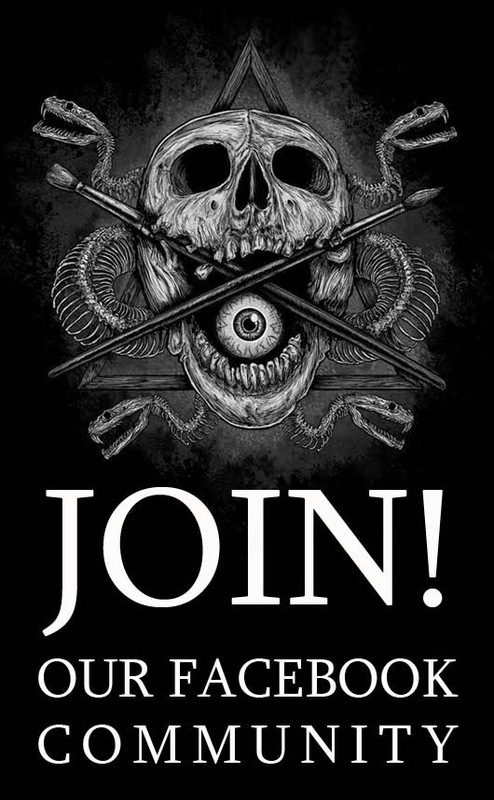 AJFA: By now, you and the band have established a very peculiar work dynamic and creative process. First, you talk on the phone. Then, you meet, eat, drink, have a good time and brainstorm about the themes of the new album. Was the initial creative process for "In Times" similar to previous opportunities? Truls Espedal: The process was more or less the same 'traditional' one that we have done on all the other covers. Ivar and Grutle first tell me about their ideas, theme and express which visual elements they want included in the cover. Then I spend a week or so getting my head around it and come up with some visual ideas before the three of us meet. But some things we did slightly different this time around. Instead of just a first phone call, we meet up backstage of the Enslaved/Wardruna concert at Eidsvoll, Norway. A brillant concert by the way! The second thing different this time around was that I actually did quite a few sketches before we met up (Usually I just have all the ideas in my head and the first sketches are done when we meet). I had rough pencil sketches for both the front and back cover, the inside of the Gatefold vinyl as well as color sketches. AJFA: Did the band give you any materials to get you inspired, like lyrics or the recording, like happened with "Riitiir"? Truls Espedal: Like last time around ("Riitiir"), I got both lyrics and songs almost from the get go. So I listened to the album the whole time I was working on the paintings and the layout for the full cover. AJFA: Visually, this is a sort of departure compared with your previous artworks for the band, especially the last two for "Riitiir" and "Axioma..." Was this change a conscious approach or was it something suggested by the band? Truls Espedal: I always try to go for the approch that I feel will compliment Grutle and Ivar's music and ideas the best. And I also want people to recognize the artwork as Enslaved, without repeating myself too much. Ivar and Grutle are the ones with the original concept and ideas, but I have a lot of creative freedom in the choice of technique, form and composition. AJFA: Stylistically, "Riitiir" and "Axioma..." were somehow related to the personal painting style you were doing at that time (using people, parts of the body, hands). 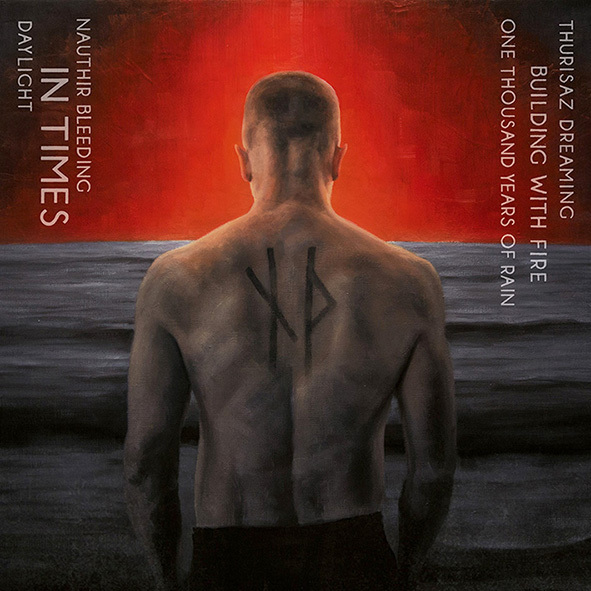 Is the "In Times" cover also related with the new painting style you're doing right now? Truls Espedal: My personal paintings are still much more similar to the style of the cover for "Riitiir." But the front-cover for "In Times" is just part of the 'package'. 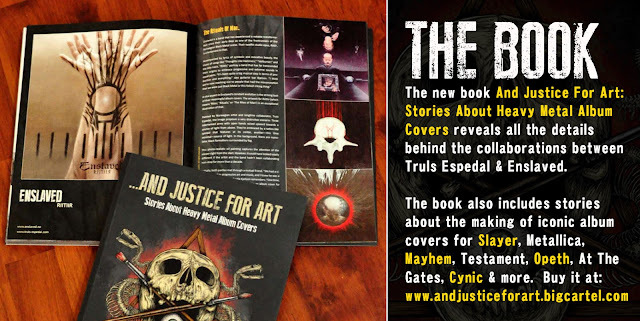 The back-cover can be described as more figurative, and the inside illustration are much more abstract. This makes the new artwork more diverse than any of the previous covers, while still keeping the more realistic style a part of the expression. AJFA: The "In Times" painting seems to have influences from Expressionism and Symbolism, especially in the treatment of color, lighting and subject matter. What's your opinion about this? Were there any artists, paintings or styles that served you as references? Truls Espedal: I think the work for Enslaved always have been full of symbolism, but as you mention, the use of lighting and color are even more exaggerated and expressionistic this time around. I wanted more atmosphere, mood and contrast. The contrast and choice of colors also serves as a reference to elements in mythology associated with Enslaved. AJFA: What's the meaning behind these human-like creatures and why one of them is disintegrating? And what about the red sun-like symbol? Truls Espedal: The figures are two Giants which can be seen as either disintegrating or coming together, and the symbol is a graphic representation of a Portal. AJFA: What's the conceptual significance of this artwork and how it relates with the album's music and lyrics? Truls Espedal: To me this artwork depicts a point of creation and represents a journey ahead: An exploration both inwards and outwards This might be more obvious when you see the full cover; front/back/inside. There are stark contrasts, details and atmosphere relating to the music, and visuals echoing the lyrics. AJFA: Can you tell me about the medium/technique you used to paint this, how long it took you to finish it? Truls Espedal: The original painting is 50x60 cm in size, and is done with oil painting on canvas. It took quite a while to finish, but I don't have an exact amount of hours. I paint layer upon layer, and each layer needs days to dry. AJFA: Where's the original painting? Who has it? Truls Espedal: The original paintings for both the front- and back cover are still in my studio in Oslo (back in early 2014). But I'm probably giving them to Grutle in April of 2015 when I meet up with the band before Enslaved's concert at next years Inferno-festival in Oslo. AJFA: Your works for Enslaved always take audiences to unexpected paths. Audiences know they are going to get something striking but don't know exactly what until they see it. Probably, this lack of predictability is part of your longtime successful relationship. Do you agree? Truls Espedal: Enslaved is a constantly evolving band, pushing musical boundaries and their own creativity. So I'm trying to do the same. I want to create something that is visually striking, layered and most importantly something that can represent the music and lyrics. If people appreciate the work and thinks that I achieve this, you could say that it is successful. AJFA: Both Grutle and Ivar have said that you are pretty much the band's sixth member. That says a lot about the respect they have for you and your work. Truls Espedal: I've always wanted to be in a band, so that's really cool haha. But, seriously, I really appreciate their gesture. We have been working together for about thirteen years now, resulting in artwork for eight album releases. The collaboration so far has been great, which I think is because of good chemistry and mutual respect for each others craft and creativity. 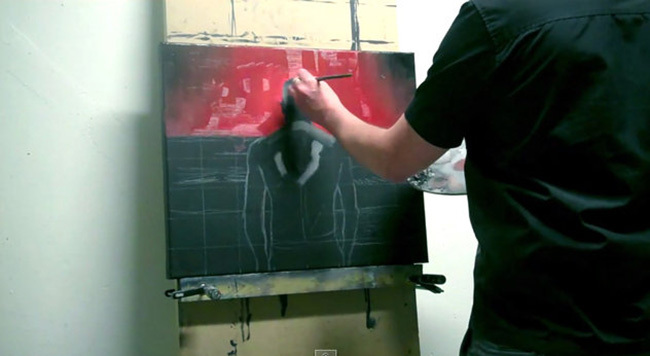 Truls painting the back cover art.